Nigella Lawson’s amazing carrot cupcakes with cream cheese frosting and walnuts, you will be amazed how good these cupcakes are. 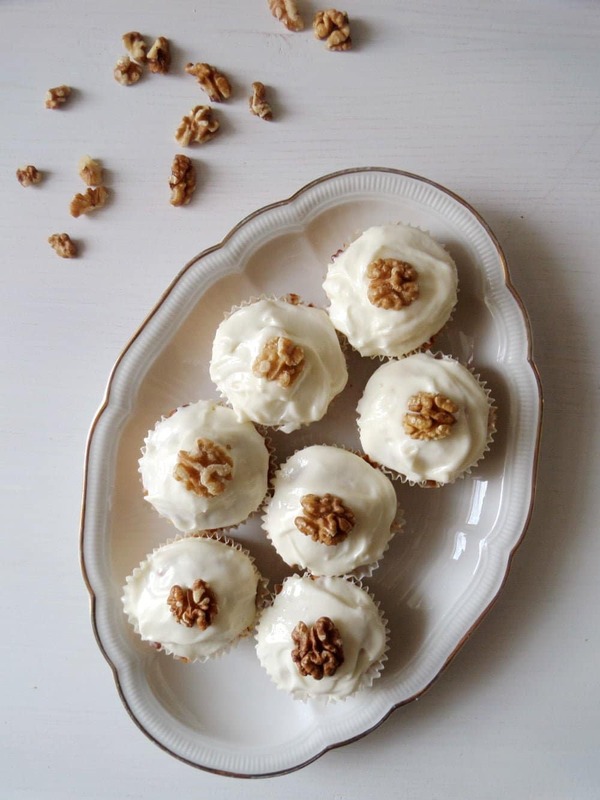 Wonderful wonderful carrot cupcakes, the best recipe for carrot cupcakes I’ve made until now. Really moist and tasty and when eaten without the icing not overly sweet. The walnuts inside gives them a bit of crunchiness and the topping makes them creamy and somehow luxurious. , a wonderful book which I bought recently on Amazon. I read it through already, but this is the first recipe I’ve made out of it. And it is great. The only problem with the book is that I unintentionally bought the American version where all the measuring is done in cups. What a mess I had today in the kitchen. Flour on every surface and on the floor, thousand cups and little bowls to wash afterward, oil spots on the pages… I was really annoyed! It is so much easier with grams and milliliter. So if anyone out there who measures everything in cups and unintentionlly has bought the metric version of this book, we could exchange!!!!!!!!! 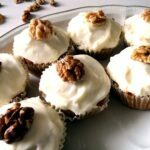 In the meantime, here is the recipe, and I am telling you, if you like carrot cake, this is a must! Mix the sugar and oil with the hand held mixer. Wear an apron if you don't want to ruin your clothes, my t-shirt is full of little oil spots. My daughter's the same. She helped. Add the eggs one at a time and mix shortly, until creamy. Mix together the flour, baking soda, cinnamon, salt, the lemon and orange zest. Add to the egg mixture and then fold in the carrots and the chopped walnuts. Spoon the mixture in the muffin cups lined with muffin paper cases. Bake for 20 minutes. Transfer onto a wire rack and let cool completely. To make the icing beat the cream cheese until smooth, that will take a few seconds. Beat in the icing sugar and add the lime juice. Spread the icing on top of the cupcakes using a butter knife. 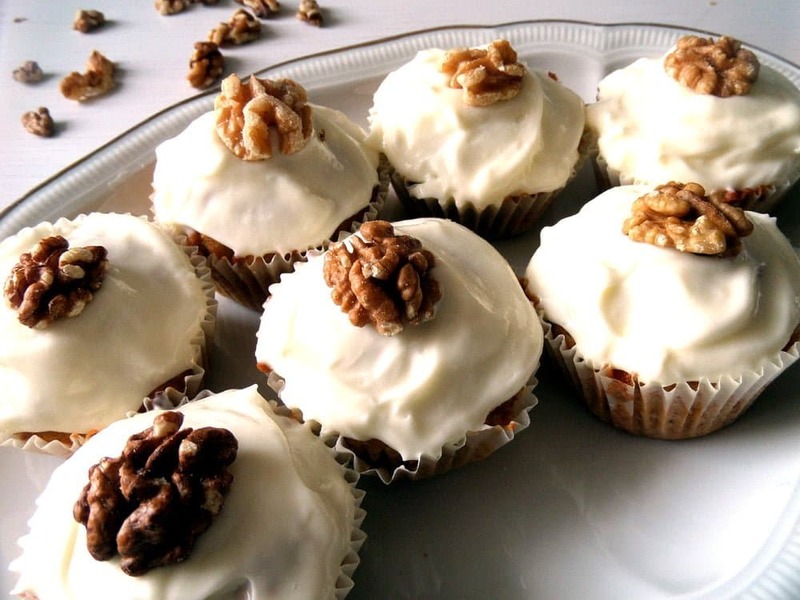 Place half a walnut on top and enjoy. 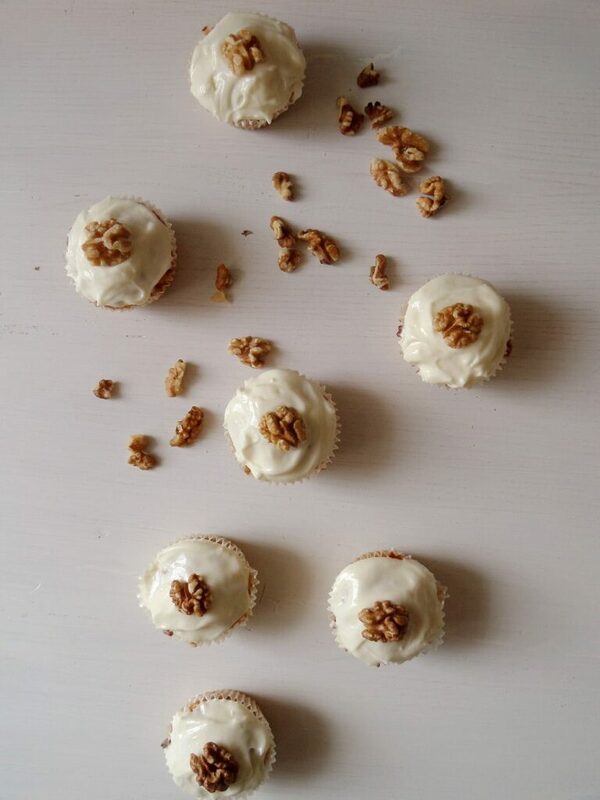 I definitely am feeling for a carrot cupcake right now.. these look delicious! Thank you, Thalia. They were really really nice.